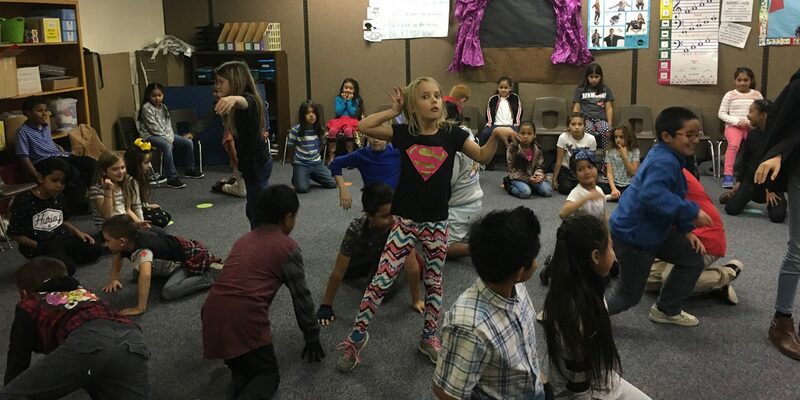 In the Drama space at Suncrest Elementary School, students have been learning about pantomime and how tableaus can tell stories. 2nd graders learned to do “the rope” and had a pantomime Tug-O-War that they acted our for their class. The 5th grade also did a Tug-O-War activity integrating the Underground Railroad and the Salem Witch Trials with drama skills. 3rd graders worked on a collaborative project where they performed a “Biomes” poem. They each took turns doing moving tableaus that portrayed the various biomes of the earth. They then performed that for their teachers and classmates. The 4th graders were given a project where they researched Utah Native American legends. Groups planned 3 tableaus to narrate the beginning, middle, and end of their stories. These were performed for teachers and classmates. 6th graders did a similar project, using Greek mythology as their point of study. They told their story through 3 tableaus, narrating and performing it for their class. We certainly had a lot of fun workshopping the tableau and pantomime projects together as a school. Student learned concepts of Science and Social Studies in a deeper way.